Epoxy powder coatings based on newer technology are known as epoxy-polyester “hybrids” or “multipolymer” systems. 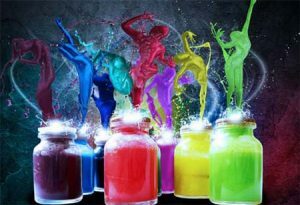 This group of powder coatings could be considered simply part of the epoxy family, except that the high percentage of polyester utilized (often more than half the resin) makes that classification misleading. The properties of these hybrid coatings are more closely akin to epoxies than polyesters, with a few notable exceptions. They show similar flexibility in terms of impact and bend resistance, but produce slightly softer films.Their corrosion resistance is comparable to epoxies in many cases, but their resistance to solvents and alkali is generally inferior to pure epoxies. One advantage of these hybrids, due to the influences of the polyester component, is high resistance to over-bake yellowing in the cure oven. This also translates into some improved resistance to ultraviolet light yellowing. These systems will begin to chalk almost as fast as an epoxy but, after initial chalking, the deterioration is slower and the discoloration less severe than for unmodified epoxy powders. Another advantage of epoxy/polyester powder coatings is their good electrostatic spray characteristics. They can be applied with excellent transfer efficiency and show good penetration into corners and recesses.An epoxy polyester hybrid should certainly be considered along with the epoxy family for thin film decorative end use. 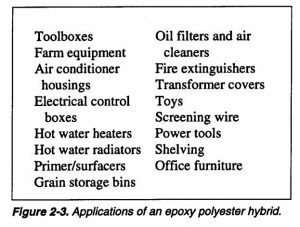 Applications for an epoxy polyester hybrid are listed in Figure 2-3; typical properties are listed in Figure 2-4.